As soon as my Arabella fabric arrives I'll start cutting kits! I'm still taking pre-orders... here are the details. When the FQ bundles and kits are ready, early February, I will send you an email with a link to the purchase page.... it's that easy! Did you catch up? We are now on the Snowflake block. One of my favorites! In real life they look like they are popping off the quilt. Sew Many Places also have a new payment plan for your trips. When you call the office ask them to work with you to develop a payment schedule that fits your budget.. pretty nice eh? So what good books have YOU read ... did you get some for Christmas? Did you read over the holidays? I put up the first three months of 2009 and hope to have REALLY good reads! Check it out, send me YOUR favorite authors that we have read yet! Gregg and I tried out my new slow cooker (seems they are NOT called a crock pot anymore).. and we made Emeril's Spaghetti Bolognese. It was FABULOUS.. a bit thin as we needed to reduce it more with the lid off. But it made tons, we froze 2 batches and have eaten them too.. we LOVE pasta! Resident Chef Patty gave us this month's dish "Cheese Tortellini with Cannellini, Kielbasa, and Kale Soup". Thanks Patty, I'll be over for dinnerl! Wow there is always SO MUCH happening and I want all of you IN on the fun! --A Newly organized page, all is still there just cleaned up! --NEW NEW NEW project coming later this month with Emilie Richards.. yes AUTHOR Emilie R and I have teamed up to bring you a BOM based on her 'Sisters Choice' book. We'll be sending a special notice out on JUST this project later in Jan! -And did you know I have a SWAP list?? We are starting 2 new swaps for Jan/Feb.. so hurry over and sign up to be in on it! 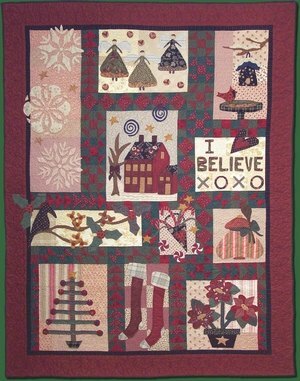 .. come one, come all and join Rachel at the Calendar Quilt Challenge blog! And guess what, I'm going to hang out too, I'll post at least once a month... cheer you on and answer any questions you have. Happiness is when what you think, what you say, and what you do are in harmony." I have been reading SO MANY wonderful New Year's posts on blogs the last few days. Resolutions, no resolutions, lists, no lists, words to live by, and many other awesome and inspirational things. At my blog the other day I was doing the 'big sigh' because I had not 'done' what I was thinking I wanted to do.... a look and plan for the next year. Then when I sat down to write this newsletter, 4 days into the year, with no time in sight to do this 'plan', I realized that maybe what I need is a bit of the 'now'. Don't we often get caught up in what we 'need to do'? If this happens or that doesn't happen then life will be better. So maybe this year I will focus on goals, but really truly and DEEPLY appreciate every second for what it is. Not look at coulda shoulda woulda.. but just look at what is and enjoy it. Be grateful, Appreciate the now. So that is what I'm feeling for the new year. I'm grateful for every second and every person, be it family or you my friends! And what ELSE did I do in December.... well I went a TAD CRAZY and started these these.. come join me.. it's awesome fun here at 'Sloanie Central'.... hehe! Facebook - send me a friend request to Pat Sloanco. Oh and if you are facebook WHIZ KID.. tell me so I can pick your brain! And a quote on the slightly SPUNKY side of things!!! This just CRACKED ME UP!